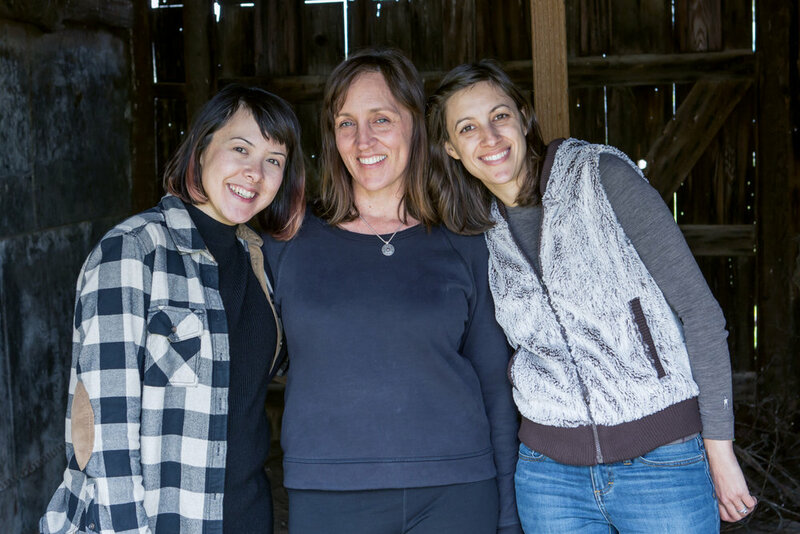 Meet Aimee, Emily & Mai-yan; three ambitious women who came together after years of camp experiences to rethink what food could be in the outdoors and founded Dirty Gourmet. 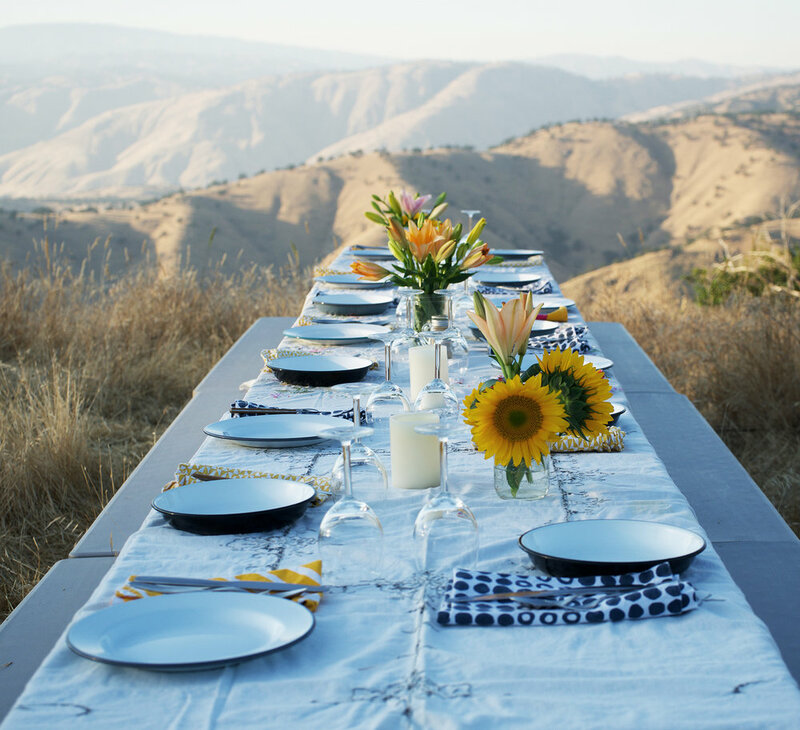 Based out of California, they believe that food should be an essential part of every adventure. 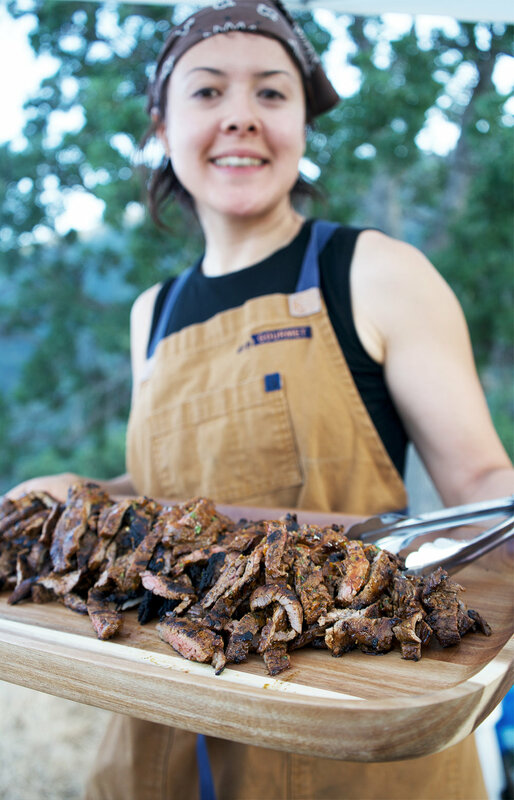 Whether it's creating delicious new recipes, teaching outdoor cooking workshops, writing cookbooks, or developing experiential catering, they love a good food adventure. MESSKIT: What did adventure mean to both of you as kids? Was it a big part of your life growing up? Emily: I grew up camping my entire life. My dad said I was on top of my first mountain by the time I was six weeks old. My parents are both mountaineers, hikers, and campers, so we spent most of our lives outside. Aimee and I are cousins as well, so our families spent a lot of time outdoors together. Mai-Yan: I definitely had an adventurous childhood, although it was less formal than Emily. I was more into going out into the woods behind our house, exploring and building treehouses from found materials, poking into the holes of marmots, and playing in the river when we knew we probably shouldn't have. We were just being in nature where I grew up and around my grandparent's house in Quebec City. Once I got my first bike though it was magical. I would leave the house and go riding for the whole day, missing dinner and returning back home late thinking that it was an awesome experience. MK: Speaking of riding bikes, wasn't the idea for Dirty Gourmet hatched on a cross Canada bike tour? Mai-Yan: Aimee and I went on the cross Canada bike tour. It was something that just came about. We thought, “We are going to be working for the rest of our lives, so let's take six months out of that time and go on a bike trip”. So we quit our jobs and went on the tour that we planned all self-sustained. At the time Emily was living in the mountains. Emily: Growing up I was living half of my life living in Las Vegas and the other half in Florida. I started to get sick of not experiencing the seasons and mountains so I ended up moving to California around Big Bear, and started working at a school teaching sixth graders. At the time I was living in the woods at a camp eating standard camp food, the same thing every week, getting very sick of it while Mai-Yan and Aimee were out on their bike tour. I ended up finishing my seasonal job and they finished their touring so we came together and started working on Dirty Gourmet for the fun of it. We started meeting and jotting down all the recipes from our experiences. MK: Was it when you started getting more into your adventures and getting tired of eating plain old GORP and ramen that you started exploring new food options? Mai-Yan: I think so. In both situations, we were living outdoors in camping situations on more of a long-term basis. When you are camping every day you start to get sick of the same thing really fast. It forces you to be more conscious of what you are eating. We wanted to eat something good, and not eat gas station food all the time… but sometimes that’s all that you get! Emily: When you ask people what they eat when they are in the outdoors they think that there is camping food; a specific menu of items that you only can eat while camping. What we learned is that you can make any real food into camp food by adjusting a few things here and there to make it more interesting. There is no such thing as camping food. Pick what you like to eat and figure out how to adapt it. MK: Exactly. That’s one idea we are trying to explore at messkit. Trying to see what the relationship is between what people think outdoor food is and what it could actually be. It doesn't have to be gourmet, but it's interesting to see what is beyond the old camping standbys. Mai-Yan: There is something nice and nostalgic about the old standbys. It's not that they are bad, but we are trying to show that you can go beyond that, put a little bit more jazz into that hotdog! Emily: Our motto is to eat what you like and make food part of the experience. So many people just make hot dogs because they can’t think of what else to cook and not necessarily because they love it. Food just shouldn't be an afterthought to your trip, it needs to be a part of the outdoors experience. MK: One thing I took from your food philosophy is that you want to make adventure accessible and you want to make food a part of the adventure. Emily: Definitely. Our goal is to get people more comfortable going outside, and a way to do that is by preparing good food for people to enjoy. MK: What sort of influences does the California food scene have on you when you are developing recipes? Mai-Yan: It definitely influences it a lot. We actually are working on a new cookbook and we realized that we have lots of Mexican and Asian recipes. Being in LA we are really exposed to a lot of different influences that may not even consciously register and you just can’t get away from it. Also in California, we have so much great produce here. Its funny when I go traveling, I’m always asking “where is the rest of the produce?” Its just different and I notice it more when I go somewhere else. Emily: There are a lot of great options for camping friendly ingredients that come from other cultures and cuisines. For example, coconut oil and curry pastes work perfectly for outdoor cooking applications that you may not have thought about. MK: So you have a cookbook coming out then! When are you guys expecting to release that? Mai-Yan: It should be out by spring of 2018. MK: Excellent! Do you guys primarily talk about recipes or do you touch on gear and pantry details too? Emily: Yes we tried to be very informative. We split it into different sections. There are backcountry recipes to be used in activities like backpacking, bike touring, kayaking or whatever you might be doing in a remote location. Then there are more car camping and day trip recipes including ones on campfire cooking. Mai-Yan: One of the big things for us is we want to take out the intimidation factor and be a resource for people cooking outdoors. There is a range of levels for the recipes in the book that we have included. There is everything in there from the beginner to others that appeal to people who want to be a bit more adventurous and play with their big dutch ovens and play in the fire a bit. MK: Can you guys describe what your basic mess kit would look like for an overnight backpacking trip? Emily: We have an official base kit spelled out in our cookbook. We talk about different types of stoves, but we usually lean towards the canister stoves which are single burner, small and lightweight. Generally, we try to be minimal and recommend a 1 litre pot, your fire making tools, pocket knife and of course a spork! Those would be our bare minimum essentials, and then we also have a list of our extras that you can add on from there. They would be our splurge items, but they definitely have a purpose and are practical. For instance, we would have pretty linen, something like an oversized napkin or bandana that could be a multi-use item. Another favourite of ours is the tiny LED tea lights. They make beautiful ambiance in any type of scenario, especially if you can’t have a campfire. Mai-Yan: Emily is pretty minimal, but I tend to bring more things like a foldable ladle and bigger cooking utensils, just for the convenience of them. But we definitely have differing opinions when it comes to our mess kit. It's always an ongoing debate even when we do workshops. We believe you can start with a base and change it to suit your needs. MK: Definitely. There are always different ways to pack, and giving people the options is great, depending what they are comfortable with. What does your backcountry pantry look like? Emily: Coconut oil is definitely on the list. It tends to stay solid in cooler temperatures so you have less oozing oil to deal with. After that, we always take basic salt and pepper, and add in pre-made spice mixes, almost like a house seasoning that you know and love. Emily: Right! Generally, we try and do as much preparation ahead of time. That means measuring all of your ingredients out and putting them into plastic baggies so that you aren't bringing a huge pantry of extras. Mai-Yan: I think for backpacking that’s true. But for bike touring it's a bit different because you are always picking up food along the way. For instance, Aimee would bring a full spice pantry which would allow us to have a lot of flexibility in cooking because you never know what ingredients you will find on the road or in the next town. It also allows for some experimentation. Emily: I always want savoury and salty! Mai-Yan: I’m always going to go for savoury over sweet. It funny because Aimee is only sweet! We never have to fight over the dessert, so it works out well. MK: What’s your biggest craving for food that you can’t bring on the trail? Emily: Well there’s nothing that you can’t have on the trail. My mindset is if you can’t bring the exact thing you want on the trail you can always find something that will satisfy that same craving. Mai-Yan: I always crave cheese, but there are ways to make it work. The rule of thumb is the more aged and dry the cheese is the longer it will last on the trail. Cheddar is ok, but you can also use dry jack, which can be hard to find. It's almost the consistency of a parmesan cheese, but a little less sharp. There’s always cheese powder, and that works too. MK: What’s did the menu look like on one of your last outdoor trips? Emily: I went backpacking a few weeks ago which was fun. I’m always looking for savoury for breakfast and I love to eat grits! We ended up making creamy grits with kale, sunflower seeds and fresh avocado (http://www.dirtygourmet.com/creamy-grits-with-kale-and-sunflower-seeds/). With lunch, we did a kale bacon wrap with red peppers, cream cheese and lentils (http://www.dirtygourmet.com/lentil-wraps/). Then for supper, I made a recipe from our cookbook. It was tacos with a spiced walnut and almond filling with dried tomatoes, bean flakes, fresh avocado, and lime. So the meat filling is actually made up of nuts and it was incredibly delicious. Aimee came up with that. At first, I was a little skeptical, but when I tasted it I was struck by how much it tasted like a real meat taco. Mai-Yan: On my last hiking trip we made a huge stack of blueberry pancakes for breakfast (http://www.dirtygourmet.com/blueberry-cornmeal-pancakes/), which was a labour of love. It took us about 45 minutes but we were in a beautiful meadow, so we just decided to hang out and enjoy the scenery. And of course, we brought real maple syrup! Then for lunch, I had made some falafel balls with flatbread, drizzled with tahini sauce and pickled onions for some crunch and juiciness. I’m a very textural eater and it's not always easy to do that while backpacking. I also always try and bring snacks that double as toppings so that you can add crunch or saltiness and variety to your meal. For supper, I was trying to create a curry recipe like one that I had at a restaurant near Emily’s house. So I made a Penang curry and served it with vermicelli noodles. I was trying to get as close as possible to the original and I feel we did a good job. MK: Can you talk about one of your biggest recipe failures? Emily: My biggest failure was the time I decided to do a skillet lasagna while doing a day trip snowshoeing with a group. I didn’t do any recipe testing at home. I didn’t have enough sauce, the noodles were the no-boil type, which I didn’t know existed, and my pot was thin and lightweight. Unfortunately, I didn’t know much about pot materials and stoves back then. I ended up burning the lasagna and everyone was depending on me for lunch so everyone at the burnt meal because I didn’t have a backup meal either. It was terrible. So I learned quickly to always test out your meal beforehand! Mai-Yan: For me, not as many people were as affected by the failure but it might have been a bigger failure because no one could even stomach the idea for the dish! We already talked about how we love savoury for breakfast, besides eggs and bacon, so I was trying to come up with a recipe for savoury oatmeal. I tried a few versions with sundried tomato and pine nuts, but it wasn’t working. I tried a few more iterations of it, but decided it just was not good. I tried getting Emily and Aimee to try it but just reading the recipe it sounded wrong. Then I tried giving it to Aimee’s dad on a backpacking trip and he just totally skipped over it. I’m not sure if I am giving up on it yet, but its just a hard one to wrap your head around. K: Is there something you learn about yourselves in the adventures you take, even how you have developed as an adventurer? Emily: For me, I like to be prepared for everything, but the fear of the unknown is definitely a thing in my life. I took an outward bound trip when I was sixteen and I was a very shy child at that point, and that trip gave me a sense of self-confidence that I have never experienced before. So I was able to take the skills I learned to be able to be self-reliant, and it felt empowering to know that I felt competent in that world. That’s also part of food for me too. I don't know that I was a real experimental cook before I got into this. Every time I come up with a new recipe, I think for sure it's going to fail. But then it doesn’t and it actually becomes one of our favourite recipes. It feels amazing to me and gives me the confidence to be experimental and just go for it and play and learn to be adaptable. That’s the truth with a lot of outdoor activities as well is that you don’t always know what you are getting into, even if you prepare as much as you can, but knowing that you are going to be able to handle it is a big part of it. Mai-Yan: Its true, Emily is the most experimental one of us and it usually turns out for the best. It's funny because we are different in our approaches and we really balance each other out perfectly. For me what I love most about my experiences is that they remind me that I am a playful person and going outside is a great way to express that in a constructive way. Its a great release for me once I am out there. I really enjoy exploring and I really love that feeling of delight when I’m discovering new things. Sometimes we lose that in our everyday life. MK: That’s an interesting point. How do you both find that balance between doing what you love, having a job and having free time for yourself? Emily: For the past 8 years we've been trying to balance it, and it has been getting a little busier every year. But we have always tried to incorporate the needs of Dirty Gourmet into everything that we do. So while cooking dinner at home why not test a recipe that could become a camping recipe, or at least have it become an influence on a recipe that we are working on. If we are doing something outdoors we usually try and tie in doing photography or making a social media post or blog post to make it all come together. Mai-Yan: Sometimes we’ll have a meeting by a waterfall or go hiking for a mile and have a picnic and do a planning meeting while we are at it. We try and get inspired for Dirty Gourmet wherever we are. Sometimes though when I am feeling overloaded by trying to balance it all I will just go out and do something outside and it usually turns out to be something I really needed and is always totally worth it. MK: Do you feel social media has diminished or improved the thrill or importance of your journey? Emily: That’s a constant discussion we have, and it depends on how you look at it. On the positive side, it is a way to show how to use the outdoors properly and it can be an inspiration for people to get out. In a personal way, its great to sit down at the end of a trip and go through your photos and pick out the one you like best and share it with the world as a form of gratefulness and reflection. On the other side, you don’t want to miss the actual sunset because you are too busy trying to capture it. Funny enough, another thing is we rarely eat hot food anymore because we are always taking pictures of our food! Mai-Yan: Yes, it definitely changes your perspective on things, and it just depends on what your motivation is. Sometimes I do feel the pressure and it definitely requires critical thinking but we always try to keep things in check as much as possible. MK: Where’s your next adventure taking you? Emily: We’re leaving tomorrow to go to Mount Hood, Oregon, to teach some outdoor cooking workshops this weekend for REI’s #outessasummit. Hopefully, we’ll get to see the eclipse! It’s the end of the summer now and we’ve had a really busy season so we’ve been away the entire time but now we’ll have a few weeks in between events which will be nice so we can be more local. Plus climbing season is here now, so that’s where our personal adventures will be taking us. Check out Dirty Gourmet's saucy recipe for salsa and corn dumpling soup. 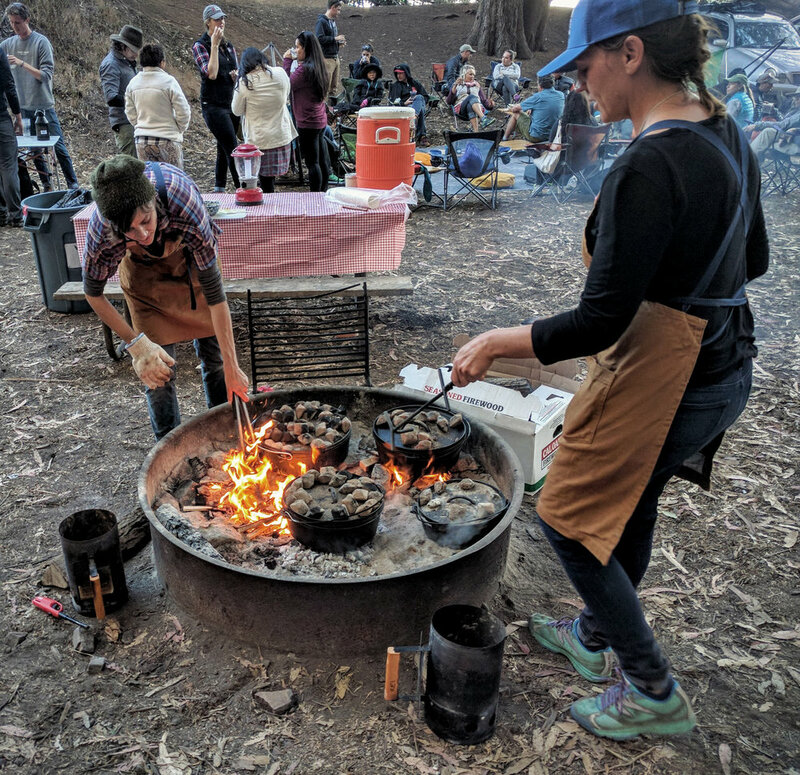 Follow along with Dirty Gourmet and don't forget to let them prepare tasty camp-made meals or teach outdoor cooking workshops for your next event.